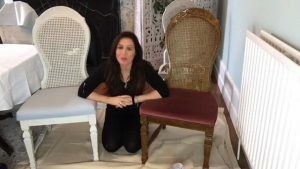 We’re talking upcycling ideas, and this is my video on how to upcycle a dining table. If you can’t see the video please click here. These days I refuse to settle when it comes to furnishing my home. This would be fine except for the fact that I refuse to pay over the odds for anything! 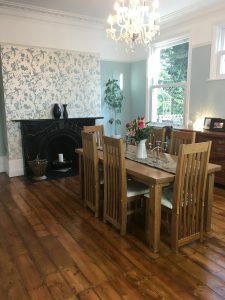 As I was finishing my house it was becoming very clear that the dining table and chairs I’d bought many years ago from a charity shop were letting down my dining room big time. It just wasn’t right for the style of house and was too small for the room. Here started my search for a suite I could revamp. I found the eight chairs on Gumtree and the table at a local charity shop, Hospice in the Weald. Including delivery I paid the grand sum of £150 for the full set. The chairs were a beautiful shape but a dirty brown colour with an even more dirty red wine faux velvet coloured seat – nice!!! You can see all the before photos in the video. I painted and reupholstered these and they came up beautifully. Check out my post on that project. The table was probably very expensive in its day, but had been scratched over the years and was just too dark for my decor. You can see the Facebook live broadcasts of this here and here. I started by sugar soaping the table to remove any grease. 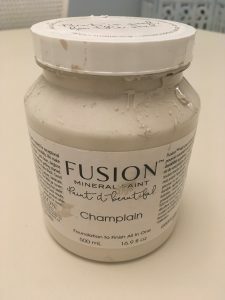 I was using Fusion Mineral paint as the top coat so really should have used the Fusion Mineral Concealer or Ultragrip. You can’t really do the next coat in a day though. Because I was doing this as a Facebook live broadcast and I wanted to be able to do it in one go (ha! When will I learn?!) I used the quick drying Autentico Primer instead. This worked out well actually, but just to reiterate, it’s always best to use the same brand for each coat where possible as it’s a gamble otherwise. 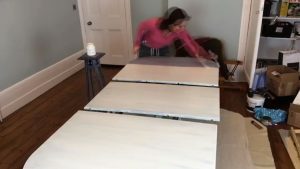 The table needed two coats of the Fusion Mineral with a top-up coat. I chose the colour Champlain which I really love. The table and eight chairs have taken just under two pots of the Fusion Mineral paint, which in my book is good coverage. My pointers would be to make sure you are using a good flat brush for the table-top as you want this to be as smooth as possible. 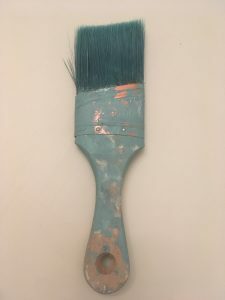 I used a Fusion Mineral brush. The Fusion Mineral is self-levelling to a degree but you still don’t want to just slap it on – particularly on flat surfaces. Also watch out for drips – particularly if you’re used to using chalk paint as this is much more runny. I have to say if I saw this dining suite in a shop I would be prepared to pay a lot for it, so this has been a real success. And that’s how you upcycle a dining table! If you want to do a kitchen table next check out my guide.